Powers/Abilities: Hargrove is a normal human who has an some knowledge in the area of atomic physics and nuclear science. Being an avid bicyclist, he is in good shape for a man his age. (Lethal Foes of Spider-Man#2 (fb) - BTS) - Otto Octavius used his connections at the U.S. Atomic Research Center to get a job for his cousin, Elias Hargrove. Hargrove embezzled company funds, but avoided repercussions due to the intervention of his cousin. For all Octavius had done for him, Hargrove felt eternally in his debt. (Spider-Man Unlimited I#3) - Hargrove fired fellow U.S. Atomic Research employee Mary Alice Burke at Octavius' behest. (Untold Tales of Spider-Man: Arms and the Man) - Randall Andros began investigating the people who had worked with Otto Octavius at the United States Atomic Research Center. He began looking for Karl Octavius and Thomas Hargrove. Clarice Levin, lawyer for Mary Alice Burke, stated that she would advice Burke not to speak with Andros, as a lawsuit against Octavius, Hargrove, and the U.S. Atomic Research Center was pending. (Lethal Foes of Spider-Man#1) - Soon after the imprisonment of his cousin Otto, now better known as the criminal Dr. Octopus, Hargrove received a phone call from Michael Gerdes, Octavius' attorney. (Lethal Foes of Spider-Man#2 (fb) - BTS) - Gerdes spoke to Hargrove about the Nuclear Blaster, a device housed at the U.S. Atomic Research Center. Gerdes explained that Hargrove was to take the device to Dr. Octopus so it could be used to bring the incorporeal criminal known as the Answer back to life. (Lethal Foes of Spider-Man#1) - Shaken and overcome by a feeling of impending doom as a result of the phone call, Hargrove was present during the explosive arrival of the Sinister Syndicate at the U.S. Atomic Research Center the following day, and was assaulted by the Vulture seeking information on the Nuclear Blaster. 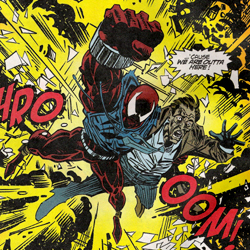 Gathering himself while Spider-Man arrived and held the villains back, Hargrove activated a Plexiglas shield, separating the webslinger from the Syndicate. Trying to reach out to Spider-Man for help with his problem, Hargrove was too frightened to speak and, as Spider-Man went after the fleeing Sinister Syndicate, he feared he'd lost his one chance for help. (Lethal Foes of Spider-Man#2) - In lieu of the Nuclear Blaster, Hargrove delivered codes to Gerdes, which were passed along to Dr. Octopus to aid in the creation of a device similar to the Nuclear Blaster. As he left Gerdes' offices, Hargrove mused over all that Dr. Octopus had done for him in the past and how that doomed him to repay his cousin. (Lethal Foes of Spider-Man#4) - Arriving near a heated battle between Spider-Man, the Sinister Syndicate, Stegron, Swarm and Dr. Octopus, Hargrove recognized that his weakness led to his cousin's escape from prison, and unless he did something about it, he'd be a pawn to him for the rest of his life. Following Dr. Octopus to a lab on the Lower East Side of Manhattan, Hargrove confronted him, drawing a gun. While impressed by his cousin's courage, Dr. Octopus nonetheless disarmed him, lifting him with his tentacles. Warned that his connection to Octavius' beloved late mother was the only reason he stopped short of killing, Hargrove was left by his cousin, though warned he would not spare him should they meet again. As police arrived, Hargrove smiled, believing that because he'd stood up to his past and survived he was no longer doomed. (Spider-Man: Funeral for an Octopus#1) - Following Dr. Octopus' murder, Hargrove, as Dr. Octopus' last living relative, spoke at a public memorial telling his cousin's associates and the numerous reporters in attendance about the gentle man his cousin was before the accident that left him twisted. After the memorial, Hargrove rode his bicycle back to his apartment, musing over the fact that with his cousin's demise, he was entirely out from under his thumb and could get on with his life. Arriving home, Hargrove was confronted by Gerdes, who, as the executor of Dr. Octopus' estate, carried out his client's orders by delivering a video recording to Hargrove. Playing the video, Hargrove watched as his cousin bestowed the legal rights to his patents, inventions and worldly goods to him. Octavius also spurred him on, telling him that only the strong survive and with these tools at his disposal he could forge his rightful destiny. (Spider-Man: Funeral for an Octopus#1 (fb) - BTS) - Hargrove used the information given in the recording to contact his cousin's former associates, Electro, the Hobgoblin, Mysterio, and the Vulture. (Spider-Man: Funeral for an Octopus#1) - Speaking to the arriving criminals via a video-feed, Hargrove told them how Dr. Octopus' notes and equipment were confiscated by the government following his death, and that he'd be interested in hiring them to retrieve them. Adding that his cousin provided information on his former associates that could be used against them if they refused, Hargrove was interrupted by the Scarlet Spider, who tracked the Vulture to the meeting. (Spider-Man: Funeral for an Octopus#2) - Packing the equipment he used to speak to the villains, Hargrove resumed Dr. Octopus' recording for the next step in his plan. Stunned by something in the footage, Hargrove left his apartment. (Spider-Man: Funeral for an Octopus#3) - Bursting into Gerdes' office with a gun drawn, Hargrove told him he'd realized the recording of his cousin was a fake on noticing the upside down reflections in his glasses. Firing as Gerdes moved toward him, the bullet instead passed through his target to Hargrove's surprise, and he was ambushed by Mysterio, who used Hargrove to create a distraction while he retrieved Dr. Octopus' files on criminal underworld figures. As Mysterio began threatening Hargrove to give up the decryption code for the disk, the Scarlet Spider burst into the office, engaging Mysterio while Hargrove passed out. Waking just as Mysterio opened the disk, Hargrove was spirited out of the office while the disk detonated. Observing the aftermath of the explosion, Hargrove offered to give himself up, but was given a second chance by the Scarlet Spider, who told Hargrove the hold his cousin had over him ended with his death, warning him to avoid criminal activity in the future. It's assumed in this profile that Elias Hargrove and Otto Octavius are first cousins, making Mary and Torbert Octavius his aunt and uncle, although it's possible they're more distant relations. Hargrove and Octavius are related through Mary although, as Octavius notes, Hargrove was a "blood relation" of his beloved mother's. Hargrove's reaction to his cousin's resurrection has yet to be seen -- presumably he's continued to stay clear of him in the meantime. Hargrove became a victim of the Robert Bruce Banner-Syndrome in the novel Untold Tales of Spider-Man.